This morning I did this sketch for my lesson in Sketchbook Skool. The semester's theme is "seeing," and the lesson was to sketch something "fast and slow": fast being a first, fast, loose painting of color to get a shape, and slow being (after the paint dried) a slowly-drawn, detailed line drawing over the top of the colored shapes. It's a clever assignment, I think, because it does make one think about the different ways of seeing -- a quick glance, a fast impression of color and shape versus a careful study of details. And it was fun, too. It reminds me that wonky is not just good, but darn fun. I want to do more of this. Have you tried it yet? As I was doing this, I was thinking how the fast glance vs careful study of details applies to life, too. Emerging from a 20 year marriage, I am often struck now at how things seem so different to me. When I was living it day to day, caught up in the whirlwind of work and child-rearing and keeping clean laundry in the cupboards and making 3 meals a day for everyone, I think my sense of what I was doing was like that fast glancing. Sure, I was in the middle of it, and I tried to stay in the moment, especially with my daughter, and I tried to notice and appreciate the details of every day. (I think that's why I got so immersed in photography years ago. It slowed me down and made me stop and look at things.) I saw a lot, I know. But I suppose it's like what you see from driving somewhere in a car -- you are moving along at a good steady clip, you're appreciating the scenery, but you can't absorb things really closely. You're just moving too fast. But now, as you know, I've found myself looking at certain things in a different way. How my husband and I related to each other, how we communicated, how we handled important or wonderful or hard things, how we challenged each other, or ignored things that were hard... How figuring out our daughter's special needs and how best to help her with things acted, in some ways, as blinders, too -- I know I became so focused on her and parenting and schooling that I just didn't have the capacity to look beyond that. I have come to understand that I was consciously looking past an awful lot. And I know, now, that that is a very common reaction to living with an alcoholic, and that embracing denial is not just a coping mechanism but in some situations a survival strategy. 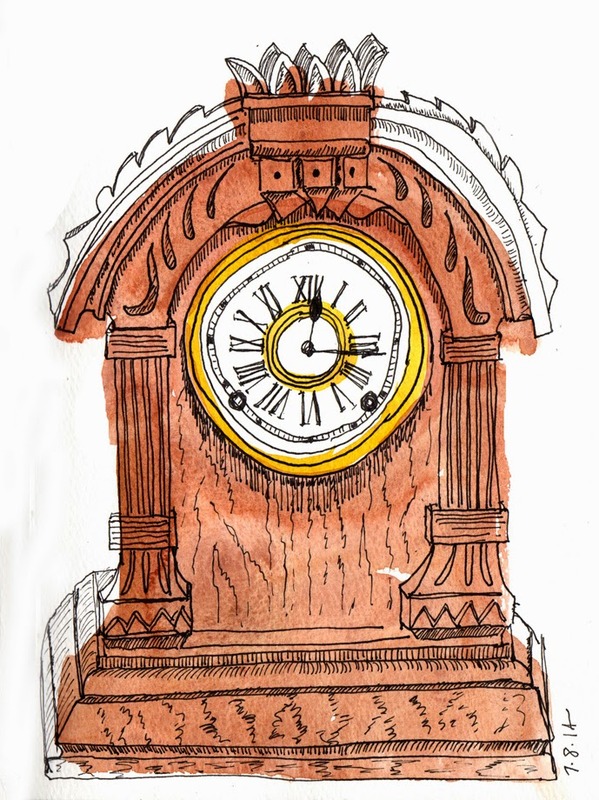 When I was drawing this clock -- which I've had for about 25 years and which sat in my office at work for the whole time I was there so I glanced at it a zillion times a day -- I noticed for the first time that the roman numeral 4 on the clock face is represented as "IIII" instead of "IV." For all the time I've had this clock and looked at it, I'd never noticed that before. So it's kind of perfect for me to be thinking about "seeing" right now, as that is what I am doing in a new way on a whole lot of levels. It amazes me how art processes can parallel life lessons. And that's what I'm wondering -- have you had the experience of some art process or lesson paralleling something non-art related in your life? Does reflecting on art or making art cause you to think in new or related ways on other aspects of your life?